What a beautiful baby she is(although I guess she isn't a baby any more!) and how perfect is this pack. Jodie has done a lovely job putting it together and you have scrapped it perfectly! 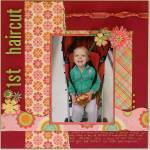 I love the way you have used the journaling strips and the pearls look gorgeous. I love the way you've used the journaling pieces. This is really pretty and so soft, Clo. Perfect for a little baby page... the pearls and lace set it off. How perfect was that pp for the photo, fantastic. Love how you have used the die cuts. Very soft and pretty, just right for a baby girl! Clo, this is just gorgeous. There's a true simplicity about the LO that allows you to focus on the love that your friend has for her little baby. You have done a very nice job layering the papers and blocks, Clo. The colours work a treat together. I like the way you have used the pearls. So soft and pretty - how lucky on the PP. I love the journalling blocks. Divine paper with the shirt! It has an almost transparent effect. Gorgeous LO. Hey Chloe! Sorry I just realised that I hadn't commented on your swap LO yet - I thought that I had. How amazing is it that the PJs match the PP? This LO is very soft and perfect for a new baby - Well done! Have fun with the leftovers!